If you are a fan of Jennifer Estep (like me), then you have been anxiously awaiting the publication of Kiss of Frost, the next book in the Mythos Academy series! The first book, Touch of Frost, was an exciting start to the series and I reviewed it back in September. Gwen is an amazing young woman on the way to discovering her path among the powerful teens at Mythos Academy. There is also a prequel novella in ebook format, First Frost, which is available now for FREE from Barnes and Noble, which you can find here. UPDATE: The e-novella is also now available free for Kobo (here) and Kindle (here). Don't wait - it will only be free until December 5th. 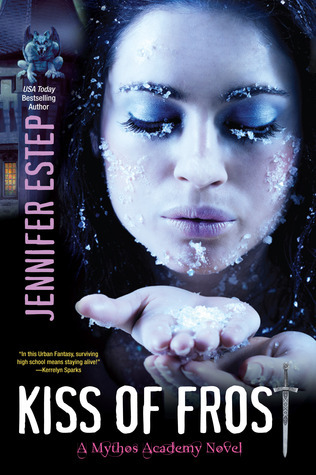 Plus, if you haven't picked up your copy of Kiss of Frost yet, then you are in luck. Thanks to Kensington Publishing, I am happy to be hosting a giveaway of one copy of Kiss of Frost for my readers. Just fill out the GoogleDocs form below with the information. The winner will receive the book directly from Kensington Publishing, open to residents of US and Canada only. Giveaway will close at 9 PM on December 13th; on the 14th will be my review and announcement of the winner. Good luck! A mistress is a fine thing - especially in the times of Regency England. Scandal and passion and love all meld together. Here is a look at two delightful titles. A whirlwind courtship can be every romantic couple's dream, but when reality sets in, Baron Edward Christie knew his marriage to Caroline Parker was a mistake. Beautiful and scandalous, not even her banishment to the notorious Jane Street diminished her. Caroline and Edward meet for one night each year, on their anniversary, to give into the painful, glorious passion they have for each other. Yet both know that it is only a matter of time before they must admit it is time for divorce. So why is it so hard to finish what should never have been started? Romances where the couple is already married are such a treat, even when the story is about falling in love all over again. Edward and Caroline clash with their opposing ways: she is brash and forthright, he is composed and stiff. Neither feels they have to change for the other, nor are they willing to admit the other may be right. A twisting tale of rediscovering love and assumed betrayal, Robinson brings two engaging characters to life with strong wit and dialogue. This book engaged me from the start. Veronica knows exactly what she wants (or so she thinks), and Sebastian is bowled over that a woman would not be desiring to tie herself to a man such as him. While obviously ego starts the walk down the path to love, both Sebastian and Veronica are willing to play the game the other sets up. The hilarity increases when Sebastian's family shows up for the holidays. If you enjoy the Christmas romances, definitely take a look at this one.